A few days ago, I asked representatives at my state capitol in Saint Paul, Minnesota, to support the labeling of GMOs (genetically modified organisms) in an event sponsored by Right To Know MN. What an empowering experience participating in the democratic process! The link between GMOs and damaged digestive systems concerns me as a Certified GAPS™ (Gut and Psychology/Physiology Syndrome) Practitioner. Numerous mental and physical illnesses result from impaired guts. I believe consumers have the right to know if GMOs are in the foods they purchase. Their health and healing depends upon it. For an engaging and thorough look at the concerns of GMOs, check out the documentary GMO OMG. 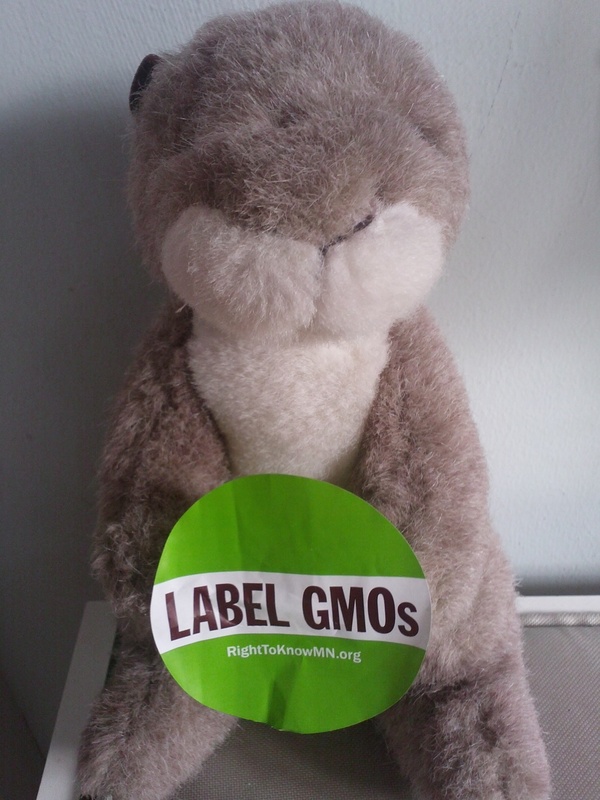 Even Moby (pictured below), the marmot from my children’s books, showed his support for labeling GMOs. Moby secretly wanted to carry picket signs and demonstrate peaceful resistance when being carried off to jail by police officers. Oh wait, that was me, not Moby. I fantasized about finally practicing my peaceful protesting skills that I acquired in a college seminar over 25 years ago. In reality, the GMO Label Day at the Capitol was a more organized, scheduled, and productive approach than storming the castle with passionate signage and song. My respectful, heartfelt interactions with elected officials and aides validated my right to a have a voice. I mattered. Voicing my concern for GMO labeling mattered, even though the bill might not pass this legislative session. After a day of activism and advocacy, my farmer and I decided to treat ourselves to a swanky farm-to-table restaurant not too far from the capital that used my farmer’s conscientious meats from animals raised without GMOs. After 10 years of successfully reading labels and menus while currently adhering to the grain-free, sugar-free diet of GAPS™, I quickly navigated the menu upon being seated by the hostess. The entrée I chose listed six ingredients, all of which I thought adequately met my dietary needs. No grains. After receiving my meal, I disappointingly proceeded to remove a 1/4 inch layer of bread crumbs crowning my dish, without intention of lodging a complaint. Unsolicited, our waiter came over concerned at my messy crumb removal. After his gluten intolerance inquiry, I confirmed that I do not eat grains. He offered to bring out another bowl of the same entrée without the bread crumbs and I agreed. While the kitchen was re-preparing my meal, our waiter comes by our table again, this time to scold me. He chastised me for not notifying him about my grain-free regimen. I defensively replied, “But bread crumbs were not listed on the menu.” Why would I bring up my dietary preferences if I had no reason to think grains were an ingredient in the dish? He continued to verbally shower me with blame. I felt belittled and powerless. I reacted defensively, disappointed in myself. After all my inward focus on prayer and guided meditations from Fragrant Heart to be a more peaceful person, his words left me upset and unable to communicate well. Granted I don’t eat at fancy restaurants often. A night out for me is usually at the local $8 burger joint where, if it’s a Tuesday, the meals are two for one. What a bargain! That being said, I didn’t just fall off the turnip truck either. I pride myself in successfully navigating the menus of all types of restaurants, from highbrow to hole-in-the-walls. Often I request to know the ingredients of sauces or specifically omit certain foods when ordering. Based on the six ingredients listed on the menu, I thought I was safe. I also assumed this upscale farm-to-table restaurant by nature would be inherently more in tune to its clientele’s priorities. Still rattled from the experience after arriving home several hours later, I pulled up the online menu from this restaurant. In small letters at the bottom it states, “[This restaurant] requests that you please inform your server of any dietary concerns or constraints.” I did not see this fine print when ordering. Even if I had noticed it, I thought my chosen entrée met my dietary requirements. I would have still deemed it unnecessary to notify the waiter. And why should I? I go to restaurants to have good food with great company without having to explain my dietary preferences and health concerns like a child to wait staff. Without labeled GMOs on food packages, the consumer is responsible to call companies and inquire about their ingredient sources. Similarly, this restaurant considers it the patron’s responsibility to solicit information because the menu lacks ingredient disclosure. Listing ingredients on restaurant menus empowers customers much the same way labeling GMOs on foods empowers consumers. We have a right to know. In August 2013, the FDA “encourage[ed] the restaurant industry to move quickly to ensure that its use of “gluten-free” labeling is consistent with the federal definition,” even though restaurants have until August 2014 to comply with the new gluten labeling guidelines according to an FDA FAQ page. Granted, going grain-free is more than just gluten, but identifying gluten is a great start to empowering diners and would include bread crumbs. Yay! As we were leaving the restaurant with one “Label GMOs” sticker still intact (mine), our waiter voiced his support for labeling GMOs without even realizing the irony of his words.